Subminiature, lightweight Gentex microphones deliver accurate frequency response and low distortion with high performance and superior noise canceling characteristics. No matter what your application may be, Gentex microphones deliver performance and reliability. Qualified OEM? Send us your requirements. Let Gentex build the perfect microphone for you. 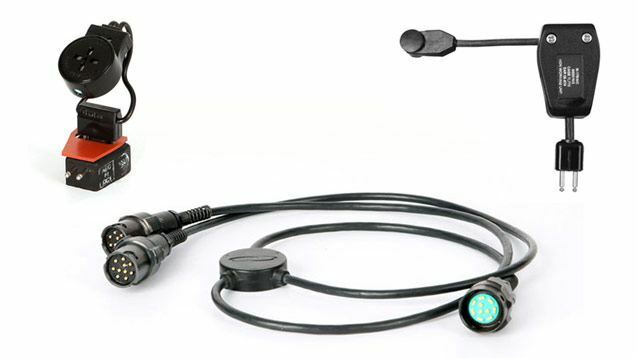 Microphone Capsules are most frequently selected when the microphone will be affixed to a helmet or headset by way of attachment to the helmet or headset’s exiting boom mechanism. Flex Boom Microphones streamline the appearance of your headwear and allow for excellent positioning of the microphone in close proximity to your lips. This position is critical for proper operation of high-performance, noise-canceling microphones. Mask Mount microphones are carefully design to operate properly in association with either O2 masks or CBRN masks. Particular attention is taken to ensure that the microphones will operate correctly and withstand the rigors of the environment within the mask cavity. 2. Now select a microphone based on the nature of the system into which the microphone must connect. Key: blue, ideal for aircrew missions; green, ideal for missions of ground forces; purple, suitable for mission of both aircrew and ground forces.